Technology and healthcare frequently operate hand in hand. In fact, connected health devices like Fitbit activity trackers and health and wellness mobile apps enable us to monitor what we eat, how much we exercise, and our overall well-being. Information related to our well-being has never been so readily available. With a few taps, you can check your heart rate, keep track of your daily step count, monitor your caloric intake, and much more. The most disruptive aspect of it all is that we no longer even need to make appointments to see a doctor. Owners of connected health devices can send data to their doctor for a diagnosis or for quick advice on how to relieve symptoms. The development of connected healthcare software technology has opened the healthcare industry to a world of opportunity. Healthcare technology innovations like remote monitoring and Telehealth are becoming exceedingly important to medical personnel and patients alike. Remote monitoring programs allow medical professionals to use devices to track patient health data over several weeks or months. This technology enables medical personnel to monitor how a patient is responding to a treatment and they can make more informed decisions to ensure optimal results. mHealth is short for mobile health, which is medical and health support provided through the use of mobile devices. Mobile devices are becoming commonplace. The proliferation of smartphones, other mobile devices such as tablets, and healthcare apps have provided a way to reach patients that might otherwise be inaccessible due to location or socioeconomic reasons. It has allowed doctors, clinics, and hospitals to provide better healthcare at lower costs. Mobile technology allows medical practitioners to provide remote diagnostics, access web-based medical records, offer timely patient information, post-procedure patient monitoring, and utilize GPS to monitor patients location. SMS messaging or push notifications can be used to provide medical information and to showcase available health care options. Personalized messages can be utilized to encourage proper use of prescriptions and to remind patients of any appointments and follow up procedures. Telemedicine is a fast-growing segment of mHealth. 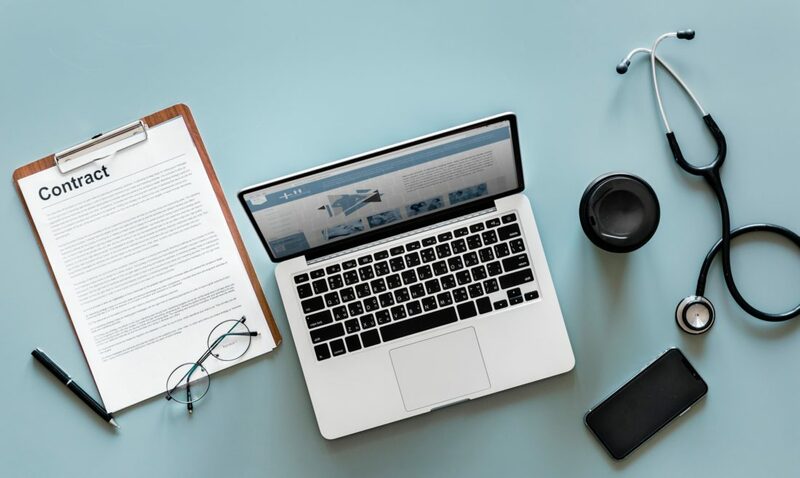 According to a report by The Business Research Company, the global market for telemedicine technology is currently worth $31.8 billion and will reach $77.2 billion by 2022. Growth at that rate will provide significant opportunities for the telemedicine market. Telemedicine allows an individual medical staff to remotely monitor a large group of patients. Diagnosis and treatment of patients can be done remotely, which drastically reduces costs and ease of treatments. Both in-facility and out-of-clinic monitoring can be done with healthcare mobile applications. Patients can now return home instead of having to stay hooked up to machines for days. The burden is also taken off the medical staff as they no longer need to be constantly checking the data and feedback from medical machinery. Connected healthcare applications can notify medical staff when their patient requires assistance. Getting patient information has always been important, but more so now with new health care requirements and regulations. Allowing the patient to complete information via mobile devices makes the data collection process less tedious and eliminates the need for overwhelming file cabinets. Physicians and caregivers can quickly and easily provide information about disease outbreaks. For example, if you are traveling in an area where diseases are prevalent, your mobile device can track your location and send a push notification alerting you of possible health threats. In addition, GPS can be used with mapping apps to show users where clinics, doctors, and hospitals are located in their area. The prevalence and ease-of-use of iPads and tablets have enabled the ever-growing number of health-conscious individuals to closely monitor their health. Patients who once felt they had limited access to their healthcare information now have it at their fingertips. For doctors and nurses, iPads and tablets unlock a plethora of health care possibilities. The device is portable, easy to use, and has an intuitive interface that is ideal for clinical applications and documentation. iPads and tablets provide quality pictures for improved analysis and more accurate viewing of images, such as CT scans or x-rays, when compared to other machine monitors. Other notable features that will enhance iPad and tablet use for Electronic Health Records’ are voice dictation, long-lasting battery, and strong network connections. These features provide for real-time data transfer and connectivity, while voice dictation makes up for the nonexistent keyboard, making it easier for providers to enter data through speaking rather than typing. iPads and tablets have become the go-to solution for busy doctors who want to keep their healthcare records organized. Additionally, using these devices also means a shift to electronic files, which eliminates the illegible handwriting that has become infamous in the medical field. As these devices become more and more reliable and failsafe, they will be involved in increasingly critical elements of the healthcare field. The Internet of Things (IoT) has been transforming the world around us opening up endless opportunities across a multitude of industries. 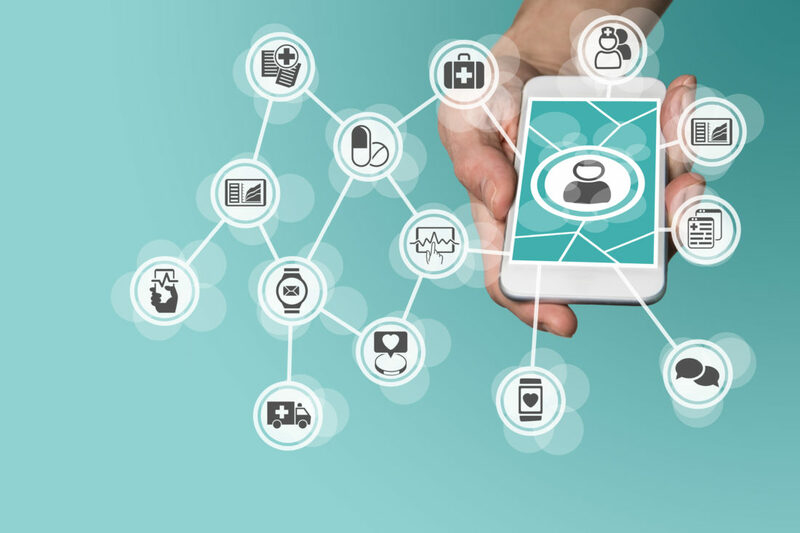 IoT in healthcare apps and devices are completely redefining how healthcare devices connect with each other delivering top of the line solutions. The Internet of Things (IoT) creates many opportunities for medical device companies to offer cloud-based platforms to facilitate wireless transfer, storage, and display of clinical data. With IoT in healthcare apps and devices, medical personnel can retrieve real-time patient data and provide timely, accurate, and data-driven diagnoses and treatments. IoT health apps and devices foster patient connectivity – something that helps medical professionals and patients build long-lasting partnerships. They enable medical personnel to collect and transmit a patient’s health data wirelessly via the internet. Then, medical personnel can maintain a secure data repository where they can read and analyze patient data any time they choose. IoT in healthcare apps and devices makes it simple for patients to automatically transmit health data to authorized medical personnel. For example, QardioCore is an Electrocardiogram (ECG) monitor that enables users to continuously collect health data related to their blood pressure, cholesterol, and other medical conditions. It also allows users to instantly send this information to healthcare providers. That way, people can use QardioCore to keep track of their personal well-being and provide up-to-date health data to their Healthcare provider without physical office visits. One of the biggest examples of connected health devices within healthcare is the Continuous Glucose Monitoring (CGM) system. CGM delivers real-time information to help people proactively manage their diabetes. This system measures a person’s glucose level in real time by placing a tiny electrode sensor under the skin. The sensor communicates with a transmitter to send information related to the user’s glucose levels to a connected health device such as a mobile app. 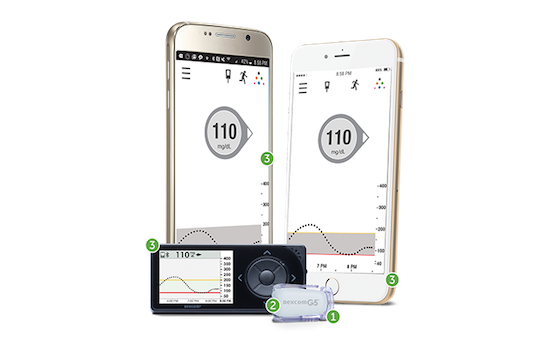 An International Medical Device Company, Dexcom, specializes in CGM systems and has created some fantastic products for people with diabetes who want to gain valuable insight into their glucose levels. Another example of IoT in healthcare are Medical Activity Trackers. You’re probably familiar with fitness trackers such as Fitbit or the Apple Watch. Using the same technology, medical device companies are now developing clinical-grade wearable trackers. These devices are being designed and developed for patients suffering from chronic illnesses such as cancer or pulmonary disease. The devices help the doctors measure advanced behaviors such as sun exposure and abnormal health patterns. This allows doctors to give more accurate treatment to their patients as well as more accurate medical advice. There are vast opportunities for IoT healthcare software like patient monitoring systems that leverage Bluetooth technologies to integrations with SureScripts for ePrescribing. One example is a web and mobile medical device solution called DizzyDoctor. DizzyDoctor takes a person’s eye and head movement using the camera and positional sensors on their iPhone and creates a remote diagnosis of benign paroxysmal positional vertigo. The best aspect about this application is that it is all remote, saving patients the trip to their local optometrist. Ultimately, IoT in healthcare is the beginning of a trend that enables you to bring your doctor with you wherever you go. IoT in healthcare technologies helps medical professionals provide comprehensive patient care and treatment while boosting patient satisfaction and retention. Additionally, patients can use these technologies to quickly, effortlessly, and securely share health data with authorized medical personnel thanks to intuitive, user-friendly custom healthcare software applications and connected devices. Some biopharma companies are now using IoT apps and devices to understand the performance of products. As a result, biopharma companies can retrieve a wide range of patient health data to increase the efficacy of medicines, match the right product to a patient before it is prescribed, and track patient services to ensure the best possible outcome after a medicine is administered. Biopharma firms can utilize connected health apps and technologies to interact with clinical trial participants around the globe. A clinical trial participant, for instance, can wear a blood pressure cuff or temperature monitor – regardless of location – and have device data flow through to a clinical trial database. This allows biopharma companies to monitor safety issues or efficacy data and analyze clinical trial results in real-time. IoT in healthcare technologies also helps streamline clinical trials. They reduce the risk of duplication of effort, transcription errors, delays, and missed data. This means biopharma companies can simultaneously improve their clinical trials and reduce the time and resources required to complete the trials. As IoT in healthcare adoption increases, new IoT apps and devices will empower medical professionals like never before. 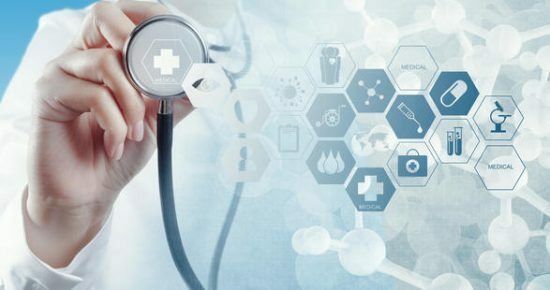 By incorporating the IoT into their services, Healthcare providers will be better equipped and can reduce their operating costs while boosting their productivity and efficiency. Medical apps for doctors as well as patient-centered healthcare apps are constantly evolving and becoming more valuable throughout the healthcare industry. Developers are seeing an increasing demand for custom healthcare software development for physicians and providers. To keep up, developers must continue to meet the high and ever-changing expectations of physicians and their practices. These innovative solutions are helping solve real problems, increase cost efficiency, and eliminate life-threatening errors. Graphium Health is a medical technology startup that focuses on data and analytics in the healthcare space. Their software applications allow providers to capture patient information and track analytics at the point of contact. One of their newest offerings is an iOS and Android app that helps streamline the surgical process, allowing providers to process presurgical forms with an iPad or iPhone. Xamarin’s cross-platform capabilities allow them to reuse a large percentage of app code across platforms. Recognizing the significant test challenge that the multitude of Android devices and form factors present, they plan to take advantage of Xamarin’s Test Cloud for quality assurance. Test Cloud allows Xamarin developers to automatically test their healthcare app on hundreds of devices using a cloud-based framework. As technology advances it will continue to revolutionize the world of healthcare. It may not be long until an AI supercomputer becomes your primary physician. But until then, we can utilize mHealth devices, IoT, and mobile health applications to improve the connected world of healthcare. When providers, payers, and patients come together in this healthcare IT ecosystem, medical breakthroughs will advance and accelerate the new norm. At Seamgen, we’ve worked on mHealth applications since 2008 and have experience with medical companies like MedImpact, UnitedHealthcare, and Cigna. If you are in the healthcare space and think you might have a need for IoT medical software, don’t hesitate to reach out to us. We are experts in healthcare software development and we can help you develop plans from start to finish that incorporates connected healthcare into your workflow.